The SoundBlocker Quilt sound absorbing quilting used for the sound insulation of stud walls and joisted floors and ceilings is largely recycled sheep’s wool, manufactured from the fleeces of sheep after cleaning and is a naturally sustainable product with little or no impact on the earth’s environment. Sheep’s wool is one of the most environmentally friendly sound insulation materials and is a by-product from rearing sheep and with an unlimited supply. The cleaning and processing of the wool does not include the use of CFC's, HCFC's or any other environmentally damaging gases. Because this product is unlikely to cause irritation to the skin, protective gloves or clothing are not normally required but a dust mask is advisable if working in a confined area such as loftspaces. The SoundBlocker Quilt sound absorber/barrier is installed in a similar way to normal glass fibre rolls between joists. The 600mm wide quilt is designed for installation between the floor joists and should be unrolled along the length of the joist and dropped down between the joists so that the edges of the quilt lap up the sides of the joists and fixed with staples or battens. Many installers prefer to fix a batten to the sides of the joists prior to installing the quilt so that they can fix the quilt to the top of the battens as shown on the photograph below. The only trimming required is to reduce the length of the product so that it sits between the joists wall to wall. The edges of the quilt should then be fixed to the joists using battens or upholstery type staples. It is important the quilt is perfectly sealed to the joists to reduce air and sound leakage. Lengths of offcuts can be used as well and should be jointed using a 50mm x 50mm batten that can be fixed between the joists just above the ceiling and the two ends of the quilts can be stapled or fixed to the batten ensuring an airtight joint as shown on the following two diagrams. 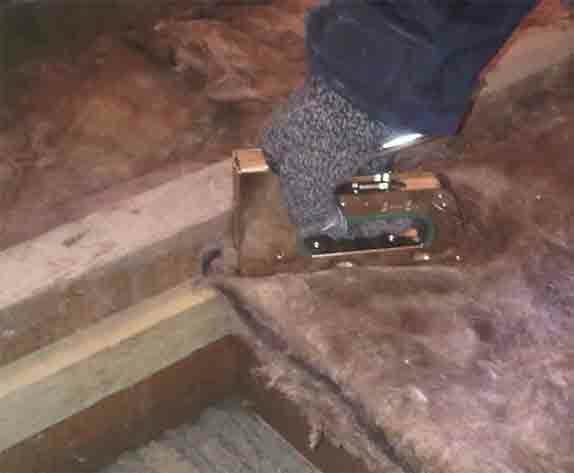 If installing within the stud frame of a wall, either the 600mm wide or 1200mm widths can be used and these are fitted in a similar way but directly to the sole plate, header plate and the vertical sides of the studs. In these cases, the vertical stud should be spaced at either 450mm or 1150mm depending on the width of quilt to be used. Please Note: This insulation is made with 25mm sheep’s wool either side of the soundproofing membrane but due to being shipped in roll form may be compressed overall to around 25mm but will recover when unrolled.